This event is taking place at Counter Insurgency Warfare School from 01 November to 14 November 2018 in Vientiane, Mizoram. The Indian Army and Japan Ground Self Defense Force are participating in this military exercise. For the first time, this joint military exercise is being done to promote cooperation between the forces of India and Japan. 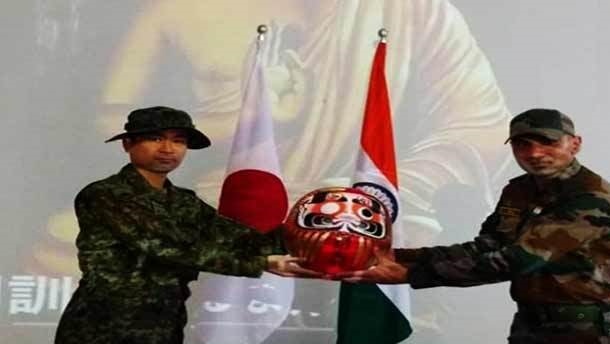 Representation of Indian Team 6/1 Gorkha Rifles and Japanese Team are being represented by 32 Infantry Regiment of Japan Ground Self Defense Force. This military exercise will also facilitate the coordination of the forces of India and Japan to face security challenges. The joint exercises are being conducted in the wild area. Its aim is to promote interoperability between the two countries' armies. In this war practice, the two countries' army will practice for the state of war and will also practice the planning and implementation of the plan for the wars of the war. During this period, security experts from both countries will share their views on various aspects related to the work of the Army. There is another important step towards strengthening strategic relations, including defence cooperation between the two countries. This joint military exercise will improve the mutual relations between the two countries and help in fighting against terrorism. This military exercise will help in developing a mutual understanding and generating respect for one another's forces. It will also be easier to monitor closely the global developments related to terrorism. This is an important step in progressive relations between India and Japan. This practice is the first military exercise with the Japanese Army.